A 14-year-old robotics specialist from Berkeley Institute stole the show at the 2016 TechAwards. Themed a ‘Celebration of Entrepreneurship and Innovation,’ the awards night saw an audience of more than 100 tech entrepreneurs offer the greatest applause to teenager Jacari Renfroe who was honoured for his work at BIOS, the independent US non-profit scientific research and educational organization based in Bermuda. 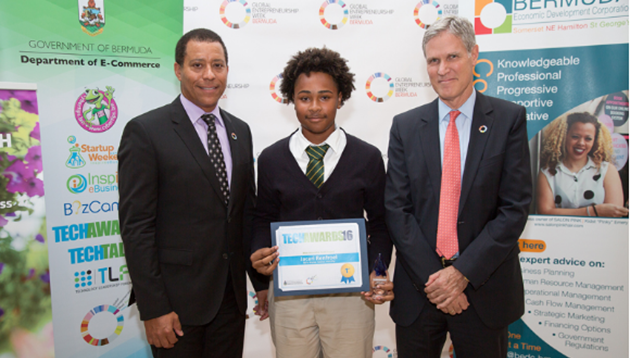 Jacari is in the BIOS Marine Science Internship Program, and won TechAwards Most Innovative Youth Program after having been nominated by a BIOS research specialist Matt Enright. Jacari built a remotely-operated vehicle that allows marine biologists to assess bacterial development within water samples at the depth the sample is taken. This provides for controls on temperature and pressure in the surrounding water. For more than a century, BIOS-based researchers and visiting scientists have worked to explore the ocean and address important local and global environmental issues.